With 100 HR at Age 23, Is Bryce Harper the Best Bet to Top MLB’s All-Time Mark? When Bryce Harper does something, he does it all the way. The latest example of this baseball truism came Thursday in the nation’s capital, when Harper launched his 100th career home run off the Atlanta Braves’ Julio Teheran. It was also a grand slam, the first of Harper’s big league career. And the Washington Nationals went on to win, 6-2, making Harper’s jack the difference. Oh, and he did it on a very special occasion. “It was my mom’s birthday today, so being able to hit her a homer was definitely huge,” Harper said, per James Wagner of the Washington Post. So it was about as awesome as a 100th home run can be. If you’d scripted it, it would seem too trite and tidy by half. Now, let’s pull back and ask a question that requires a ton of conjecture and some telescopic forward-gazing: At the tender age of 23, is Harper the best bet to someday break baseball’s all-time home run mark? Yeah, it seems crazy to even talk about. So much can happen over the course of a career—including, most notably, injuries. Even the biggest talents can fizzle and falter at any time. But admit it—you’re at least slightly intrigued. First, let’s crunch some numbers. If Harper matches last season’s home run total of 42, he’d finish 2016 with 139 dingers. After that, if he averages 40 every year for the next 10 years, he’d be sitting at 539 going into his age-34 season. That would be an impressive stretch of fence-clearing production, but by no means a ludicrous or unattainable output for a guy like Harper. Remember, as much as the reigning NL MVP has already made his mark on the game, his prime is still far on the horizon. So let’s say Harper gets there. For perspective, Barry Bonds, the all-time home run king with 762, had 411 home runs entering his age-34 season. Bonds, of course, went on a historic, almost surely chemically aided home run binge in the final decade of his career. So that’s an imperfect comparison. A better comp might be Hank Aaron, who sits second all-time with 755, and had 481 homers entering his age-34 campaign. Or there’s Babe Ruth, third all-time with 714, who had 470. Aaron played until age 42, and Ruth until age 40. So to have a realistic shot at catching Bonds, Harper would have to vault past that 40-homer average, find the (hopefully natural) fountain of youth in his later years and/or stay productive well into his 40s. That’s a tall order. Just ask the New York Yankees’ Alex Rodriguez—one of seven players to reach 100 homers at a younger age than Harper, according to the Elias Sports Bureau (via ESPN Stats & Information). For a while, it looked like A-Rod might have a shot at the all-time mark. Now, he seems destined to fall short, especially if he retires after the 2017 season like he’s indicated he might. This is a steep, difficult mountain to scale. Many greats have tried and fallen short. Speaking of greats, is there anyone aside from Harper in today’s game with a realistic shot? The active leader behind Rodriguez is the Los Angeles Angels’ Albert Pujols with 560. At age 36 and with injury issues nagging him in recent years, it seems unlikely Pujols will sniff 700. Miguel Cabrera, with 409 at age 33, is a better bet, but it’d take a massive late-career surge and a serious assist from Father Time. The more likely challengers have fewer home runs to their name but are also much younger. At age 24, the Angels’ Mike Trout has 140 jacks. He might be Harper’s stiffest competition in this completely speculative future. Imagine them battling it out in 2031, when we’ll have put a man on Venus but still won’t have real, functioning hoverboards. There’s also Giancarlo Stanton of the Miami Marlins, possibly the best pure power hitter in baseball. Stanton is sitting at 183 home runs at age 26, though he also has some troubling injury history. The same can be said of Harper, who eclipsed 150 games played for the first time last season. Again, that’s why this is such a monumental feat—it requires an insane mixture of ability and durability. Harper, though, has that quality that makes you think he could get there—that rare melange of brashness, bravado and a flair for the dramatic. Oh, and generational ability. That, too. For now, Nats fans can bask in the glory of their newly minted 100-homer man. And Bryce’s mom can enjoy her gravity-defying birthday present. When Harper does things, he does them all the way. Someday, we’ll find out if that includes breaking seemingly unbreakable records. All statistics current as of April 14 and courtesy of Baseball-Reference.com unless otherwise noted. How Worried Should Diamondbacks Be About $206.5 Million Man Zack Greinke? After debuting with seven earned runs in four innings against the Colorado Rockies, the Arizona Diamondbacks were surely hoping Zack Greinke would look more like the ace they deemed worthy of $206.5 million in his second outing on Saturday. Instead, he only went from bad to less bad. In six innings against the Chicago Cubs, the veteran right-hander paced Arizona to a 4-2 loss by allowing four earned runs on seven hits and three walks. You probably already know what the good news is, but here goes anyway: It’s only been two starts. That’s not a small sample size. It’s an itty-bitty sample size. Still, it’s only human to be nervous about Greinke. Itty-bitty sample size be damned, just how worried should the Diamondbacks be? For starters, there’s no getting around the fact that Greinke’s first outing in his colorful new duds was a legit stinker. The Rockies did not rack up Texas Leaguers and seeing-eye singles against him. Three of their nine hits left the ballpark and, according to FanGraphs, 47.4 percent of their balls in play off Greinke qualified as hard-hit. Greinke’s trademark control, however, was not the problem. After walking only 1.6 batters per nine innings last season, he walked only one Rockies hitter. And overall, slightly better than half of his 82 pitches found the strike zone. With that being the case, one might expect that Greinke’s stuff was the problem. He is beginning his age-32 season, after all, and Ken Rosenthal of Fox Sports reported that Greinke was pitching through the flu. Nope. Per Brooks Baseball, Greinke’s four-seam fastball was sitting at 92.5 miles per hour. That’s only a shade below where he was sitting at the end of 2015, and well ahead of where his average fastball velocity (91.1 MPH) was last April. When asked about this, Greinke told Nick Piecoro of the Arizona Republic that it was “possible.” But he wasn’t so much worried about that as he was about what he knew he did wrong. As Brooks Baseball can show, Greinke mostly stayed away from both lefties and righties. By the righties in particular, that’s where he was hurt. There could be something to this. As I noted recently, Greinke dominated last year by feeding lefties fastballs and changeups away and for righties fastballs and sliders away. But though it worked wonders for him last year, his debut raised the question of whether the jig is up. Which leads us to the big question: Did Greinke make any changes on Saturday? Sure did! He was much more proactive about working Chicago’s left-handed hitters inside than he was with Colorado’s left-handed hitters. It was largely the same story against Chicago’s right-handed batters, who had to put up with Greinke working both sides of the strike zone. Meanwhile, Greinke’s velocity was fine. He sat at 91.9 miles per hour with his four-seam fastball. That may be a half a mile per hour off where his heat was in his debut, but it’s still well ahead of where he was last April. Armed with a better approach and decent velocity, it’s no wonder Greinke was a tougher nut to crack. After striking out only two Rockies, he struck out eight Cubs. And though the batted-ball data isn’t yet available, the Cubs didn’t seem to make a ton of loud contact off Greinke after a rough three-run first. That’s not a pitcher who was all over the place. Even when Greinke missed, he mostly didn’t miss by much. Had he gotten more favorable calls, maybe we wouldn’t be talking about a three-walk performance. But rather than hope for better luck, this is where Greinke may have to make his next adjustment. As Brad Johnson of FanGraphs noted in his breakdown of Greinke for the 2016 season, his move from the Dodgers to the Diamondbacks involved swapping an elite pitch framer (Yasmany Grandal) for a mediocre pitch framer (Welington Castillo). That already seems to be having an effect. According to Baseball Savant, Greinke got more called strikes outside the zone than all but four other pitchers last season—vindication for Bryce Harper! He got only four calls outside the zone in his debut, and the eye counts just three in his second outing. But as far as concerns go, Greinke having to worry about the number of calls he’s getting outside the zone is a minor one. It would be a much bigger deal if his overall control, his velocity or his approach to pitching were all sending up red flags, but they’re not. The first two are fine, and the third looks like a problem he’s already on his way to figuring out. Through two starts, Greinke has a 9.90 ERA. It doesn’t take a mind-reader to know the D-backs were hoping their $206.5 million man would make a better first impression than that. But rather than broken, it looks like their big investment just needs a little more assembly. Tuesday night’s contest between the Toronto Blue Jays and Tampa Bay Rays ended in controversy after a slide by Jose Bautista at second base resulted in a “Chase Utley Rule” double play. With the bases loaded, Edwin Encarnacion hit a ground ball to third. Running from first, Bautista slid into the bag, and Rays second baseman Logan Forsythe threw wide of first as he tried to complete a double play. It appeared two runs had scored in what was a 3-2 game. Instead, the umpires ruled Joey Bats did not “make a bona fide attempt to reach and remain on the base.” They thus ruled Encarnacion out as well, ending the game. The countdown to Opening Day is down to mere days, and with each passing hour, the anticipation and excitement for the return of meaningful baseball only grows. That anticipation doesn’t just lie with fans, either. It affects players, pundits, managers and front office executives as well. For those last two groups, that excitement and anticipation is mixed with pressure and anxiety. Final roster decisions need to be made, putting them in potentially uncomfortable positions, especially when it involves delivering bad news to players about their Opening Day status. Does a dominant spring ensure a player’s spot in an Opening Day rotation? Is a former All-Star’s career over? Will there be fisticuffs in the first night game of the season? We’ll hit on all of that and more in this week’s edition of Fact or Fiction. Before their 2016 regular season opens on April 4 against the Washington Nationals, the Atlanta Braves have a few questions to answer. Even with the well-known youth movement in place with for the Braves, there is plenty of controversy surrounding their veteran players. Michael Bourn, Jeff Francoeur, Nick Markakis and Emilio Bonifacio are all embroiled in the team’s vague outfield plans. Likewise, Atlanta will need to make some tough decisions concerning its pitching staff, which could carry more veteran arms than previously expected. Over the next week, many of these issues will be resolved—for the time being. Until then, let’s take a look at the five most burning questions, and what the most likely resolution appears to be at this point. Chase Field may be less than 20 years old, but the Arizona Diamondbacks are already considering playing elsewhere in the future. Craig Harris of the Arizona Republic reported Thursday the team is upset that Maricopa County is unable to provide what it feels are necessary $187 million stadium renovations. This is a sponsored post written by me on behalf of Gillette at Sam’s Club for IZEA. All opinions are 100% mine. I remember when I started shaving, over 20 years ago, the best you could get was maybe a two-bladed razor with a tiny strip of lubricaton. Then as time passed, three-bladed razors came out; the thinking seemed to make sense: if two blades are good, three must be better! And it was. Then four-bladed razors hit the market and I thought surely there must be no need for that. What can four-bladed razors do that 3 blades can’t? Well… it turns out, sometimes more is better. You got a smoother, cleaner shave with less tugging. 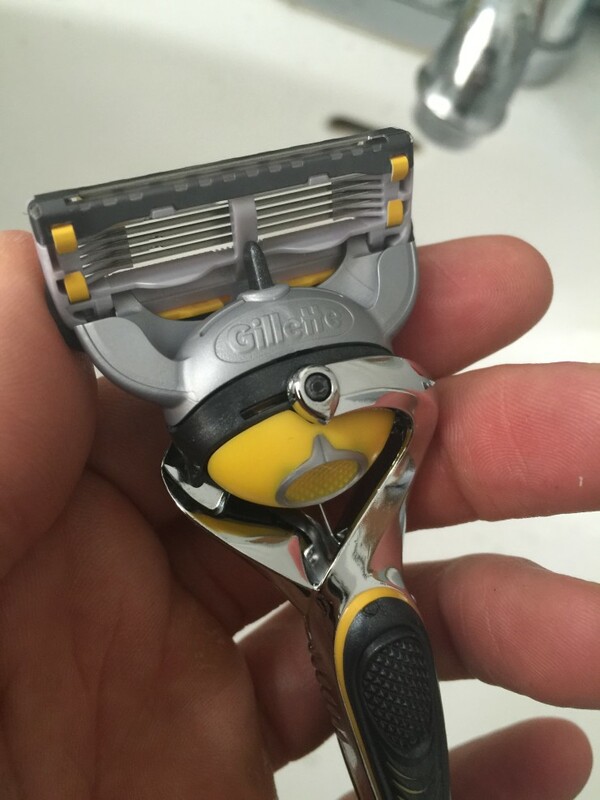 Well, I’ve been playing with Gillette‘s newest Fusion ProShield razor for the last few days, and I’ve come away more than impressed. Yes, it’s sporting not four, but 5 (count’em!) blades! But more importantly, it packs two generous strips of lubrication before and after the cutting material. This, along with one precision trimmer on the back, make for the smoothest, silkiest razor I’ve used, ever. I went to Sam’s Club to get the pack with 9 blades. That’s enough replacement cartridges to last up to 9 months with regular use. 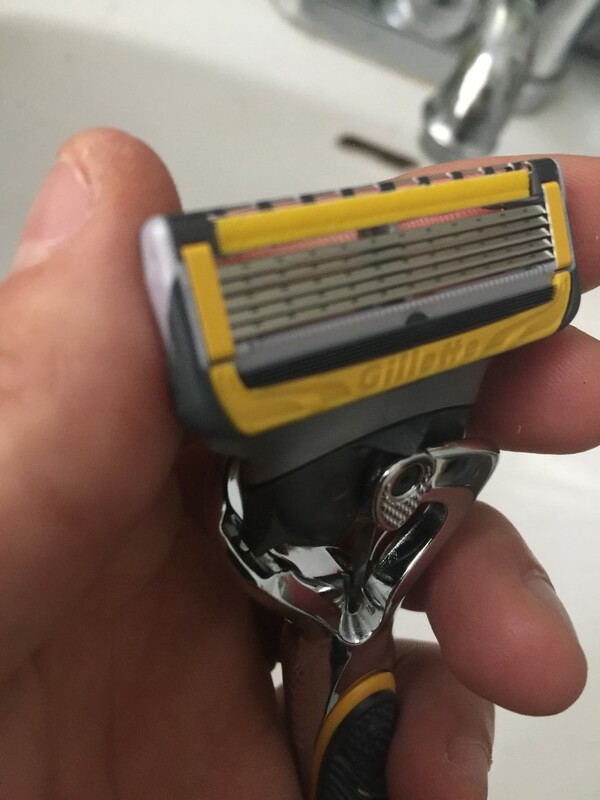 It was my first time using a razor from Gilette’s Fusion line, and the first thing that struck me was how nice it felt in the hand. 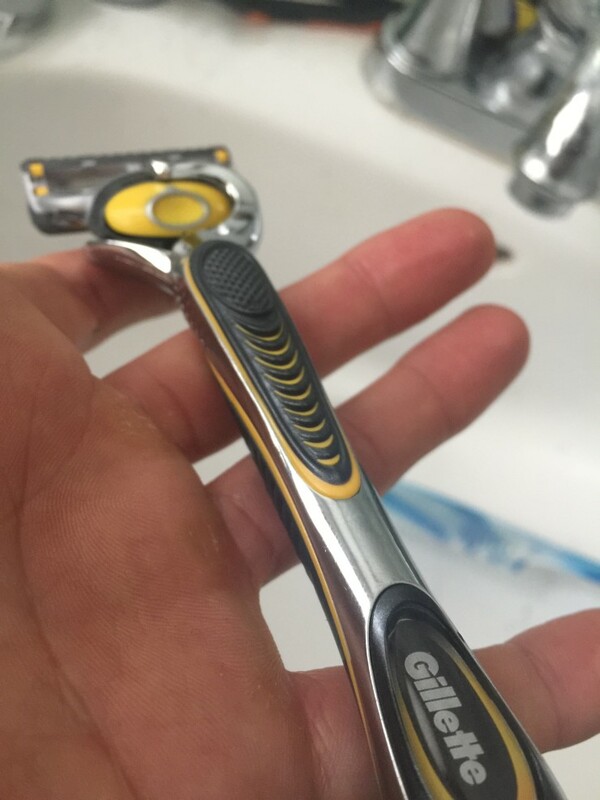 It’s a relatively heavy razor, made from plastic and metal, and feels very balanced. The blade swivels back and forth, and the Flexball allows for side-to-side movement, which contours your face and allows for a closer shave. I found the amount of resistance the spring-loaded mechanism gave to be just right, strong enough to apply adequate pressure when shaving, but not so to resitant as to cause discomfort. The lubrication strips are placed before and after the cutting blades, and make quite a difference in your shaving experience. Speaking of which, shaving with the Gillette Fusion ProShield is a pleasure. The blades glide smoothly over your skin and you feel barely any tugging or pulling on your hair. You only need one pass to get a clean shave, although going against the grain smooths it down even further. Thanks to the lubrication strips, doing this is pain free. The precision trimmer then lets you get in very close to the edge, making it possible to create crips lines when you wish to do so. It’s a single blade, so of course it’s not recomended to remove more than a couple of milimters at a time with it. Despite the fact that it’s a five-bladed razor, running water through it thoroughly cleanses it and hairs don’t clog it up at all. Changing cartridges is straightforward, and a plastic holder at the back of the carrying case holds up to 5 of them at a time. All in all, I’m very satisfied with my purchase. 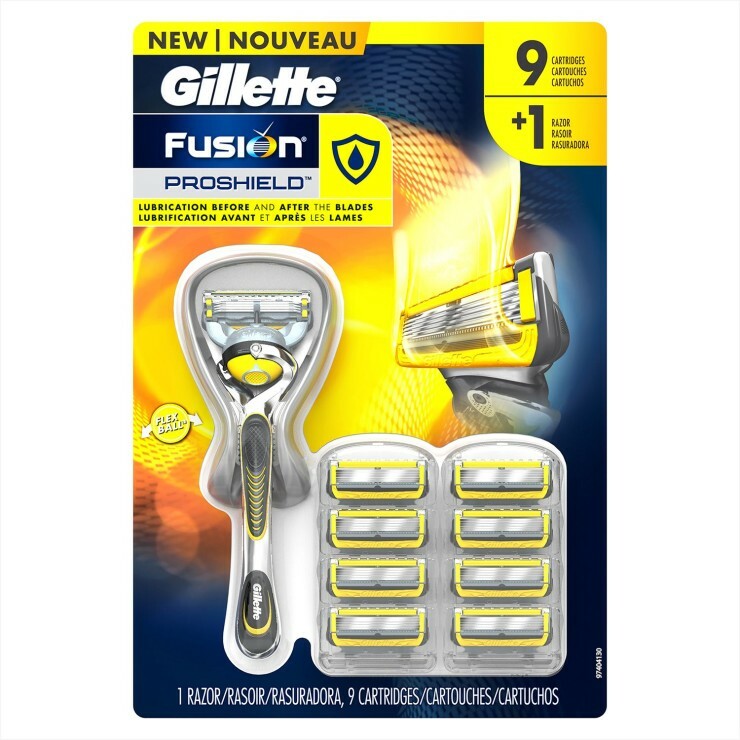 Gilette’s got a solid product with the Fusion ProShield. If you want to win your own Sam’s Club gift card, feel free to either comment on this post or share it on your social networks. Joe Garagiola Sr., who spent nine seasons in MLB before moving on to a storied broadcasting career, died Tuesday. He was 90. “We are deeply saddened by the loss of baseball legend and former #Dbacks broadcaster Joe Garagiola,” the Arizona Diamondbacks said in a Twitter statement. Garagiola batted .257 with 42 home runs and 255 runs batted in across his nine seasons, playing for the St. Louis Cardinals, Pittsburgh Pirates, Chicago Cubs and New York Giants. A St. Louis native, he joined the Cardinals’ radio broadcast booth—where he truly found his calling—after retirement. Garagiola’s broadcasting career spanned parts of seven decades. He spent a majority of his career calling baseball games for NBC, serving both as a play-by-play announcer and a color commentator. His work with Vin Scully carried the network throughout much of the 1980s, and the pair called multiple All-Star Games and World Series together. The two famously called Kirk Gibson’s 1988 World Series home run in one of the most iconic moments in MLB history. “Scully and Garagiola are considered by many to be the best baseball announcing team ever,” Larry Stewart wrote in a 1987 Los Angeles Times profile of the two. “Joe was remarkably prepared for every single broadcast. He was professional from head to toe. And fun to work with, as you can well imagine,” Scully said in a 2013 broadcast after Garagiola’s retirement, via Eric Stephen of SB Nation’s True Blue LA. After leaving NBC after the 1988 season, Garagiola largely stepped away from full-time duties. He briefly worked for the California Angels in 1990 and then was an occasional broadcaster for the Diamondbacks from 1998 through the 2012 season. While he never worked a full-time schedule, Garagiola became a beloved member of the community in Arizona—staying long after his son Joe Garagiola Jr. left the organization. In addition to his work in baseball, Garagiola had a notable career in other forms of media. He served as a panelist on the Today Show for nearly a decade (split across two stints), was the host of a number of game shows and even was the guest host of The Tonight Show at times in place of Johnny Carson. The Baseball Hall of Fame honored Garagiola twice, first in 1991 with the Ford C. Frick Award and again in 2014 with the Buck O’Neil Lifetime Achievement Award. He is one of just three men in history to win the Buck O’Neil award. The Tampa Bay Rays became the first Major League Baseball team in 17 years to play a game in Cuba, defeating the national team, 4-1, in an exhibition in Havana on Tuesday. The Rays also got a terrific start from Matt Moore, who is looking to rebound from a poor 2015 in which he finished with a 5.43 ERA in 12 starts after returning from Tommy John surgery. The left-hander hurled six shutout innings against Cuba, allowing six hits with three strikeouts and one walk. While the final result on the field certainly held importance to the enthusiastic crowd in attendance, the game was about far more than just baseball. Diplomatic relations between the U.S. and Cuba were restored last year, following a 54-year embargo dating back to 1961. That’s what this visit is about: remembering what we share, reflecting upon the barriers we’ve broken — as people and as nations — and looking toward a better future. Because while I will not ignore the important differences between our governments, I came to Cuba to extend the hand of friendship to the Cuban people. There are certainly substantial differences between the U.S. and Cuban governments that are not going to resolve themselves overnight. Time will hopefully help lead to changes in that regard. This was about the power of sports and baseball as a unifying force. Varona led off the game, grounding out on the first pitch he saw, and received a nice ovation from the crowd. No one was doing a better job of promoting the game and having more fun than Rays pitcher Chris Archer, who continues to be an awesome person to have around even when he’s not playing in the game. Luckily, Archer didn’t seem too upset about the president needing a brief introduction to his credentials. Jeter is right about MLB being better with personalities. Archer, Bryce Harper and Jose Bautista are some of the league’s best and most exciting players. Let them be who they are, especially if it helps the game reach new audiences. In many ways, that was the metaphor for this game. Cuba is a baseball haven, and being able to bring MLB back to the country after a 17-year absence will only increase the fervor around the sport. The score didn’t matter as much as the feeling and emotion attached to it. Playing fetch is awesome when you’re lazy. You just toss the ball, and your dog does all the work. But you’re still limited by how far you can toss, which in turn increases how often you have to bend down and pick up the darn ball. Never fear though, the HurriK9 can dramatically cut down on your effort levels. It’s a combination launcher and foam ring that can propel said ring up to 120 feet with minimal effort. You simply pull back on the mechanism, and launch. 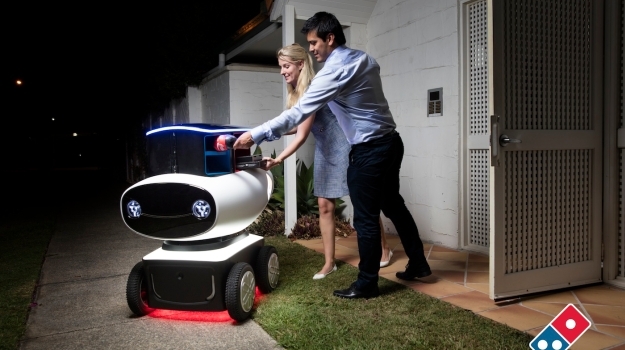 The ring spins through the air and floats ridiculous distances while your dog chases after it. There’s even an XL version that will launch rings up to 100 yards! 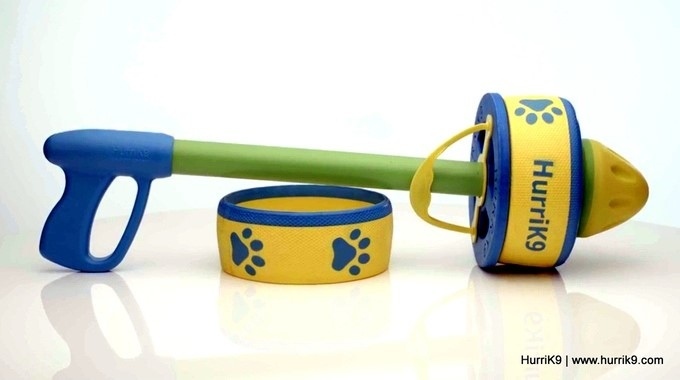 The rings are made from Ethylene-Vinyl Acetate (EVA) Foam, the same material used in Crocs Shoes and will stand up just fine to a dog’s teeth, within reason. You will have to replace the rings eventually, but the starter pack comes with 3. 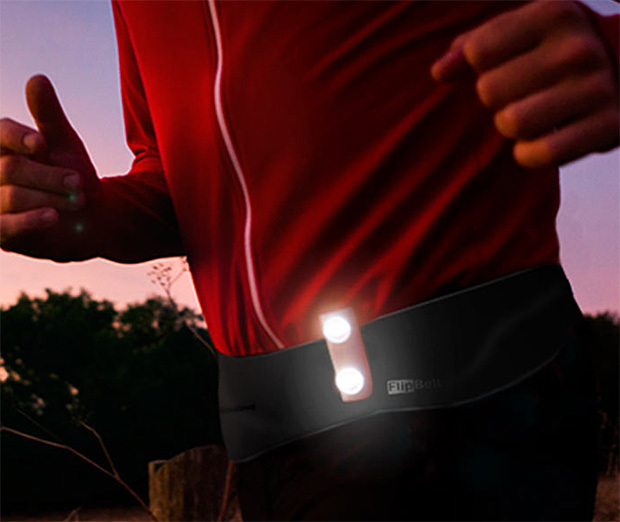 Currently well funded on Kickstarter, the HurriK9 requires a $39 pledge. Expectations. Every team carries them out of spring training, but not every club will end up fulfilling them. For some, it’s scratching into the postseason; for others, it’s World Series or bust. All we know at this point is that a few squads will overachieve and others, necessarily, will underachieve. While we wait for the meaningful games to begin, let’s run through each division and sort the expectation-exceeders from the teams that are poised to disappoint. It’s only March, obviously, and a lot can change. But in making these predictions, we’ll limit our focus to expected contenders and use FanGraphs‘ projected win-loss totals (as a jumping-off point, not a final arbiter), any pertinent injury news or spring developments and a dollop of gut feeling. As ever, feel free to sound off with your predictions in the comments and proceed when ready. The 2016 MLB season is set to begin on Sunday, April 3, with a tripleheader of games that concludes with a World Series rematch between the New York Mets and Kansas City Royals on Sunday Night Baseball. One alarming concern for the Chicago Cubs is a bone chip in Jon Lester‘s throwing elbow. It’s just a matter of hopefully it stays put, and we don’t have any worry about it. And then if it does become a concern, if I start having inflammation or missing starts because of it, then that’s when we’ll probably sit down and talk to somebody about getting it removed. As of now, knock on wood, I haven’t had any concern with it. Yahoo Sports’ Jeff Passan first reported the chip existed in his new book, The Arm, which is set to be released in April. The book, which discusses the epidemic of elbow injuries suffered by pitchers, chronicles Lester’s path to joining the Cubs. Lester’s bone chip was discovered when he underwent an MRI in 2014, well before the Cubs signed him to a six-year, $155 million deal in December of that year. Passan reported (h/t Sahadev Sharma of The Athletic) that Lester’s ulnar collateral ligament—the tissue that, when torn, requires Tommy John surgery—looked fine. Passan noted that “at some point it would warrant surgery,” though doctors weren’t recommending it at the time. Lester is fearful that surgery could spark a separate injury. Lester, who has a track record of good health, was upfront about the issue with the Cubs, who weren’t fazed, per Passan. The North Siders are a little more than two weeks away from embarking on one of their most highly anticipated seasons in recent memory. Coming off a 97-win campaign in 2015 that culminated with a berth in the National League Championship Series, expectations are sky-high for the franchise that hasn’t won a title since 1908. Last year, Lester was overshadowed by NL Cy Young winner Jake Arrieta, who emerged as the ace by the All-Star break. But the hard-hurling lefty will be as vital as any other piece of the team if it hopes to make another lengthy run in October. The St. Louis Cardinals announced Saturday that they reached an agreement with infielder Ruben Tejada on a one-year contract. The Cardinals confirmed the addition on their official Twitter feed. Tejada joins St. Louis after the New York Mets released him earlier in the week. Joel Sherman of the New York Post reported Tejada will earn $1.5 million in 2016. He was the odd man out in New York after the Mets retooled their infield with the additions of Neil Walker and Asdrubal Cabrera, leaving Tejada and Wilmer Flores to fill the same role. Although Cabrera is currently battling a knee injury, the Mets decided to release Tejada, a 26-year-old natural shortstop, anyway, likely due to the financial implications. Adam Rubin of ESPN reported they’ll have to pay less than $500,000 rather than be on the hook for Tejada’s $3 million base salary. St. Louis recently lost starting shortstop Jhonny Peralta to a thumb injury that could cost him the entire first half of the campaign. Add in the fact that the Cardinals had success over the years plugging versatile players like Tejada into their system, and it was a likely match. The Panama native gets on base at a solid clip (.338 OBP in 2015, .330 for his career) but doesn’t do much else offensively. His career high in both home runs and stolen bases is just five. But his ability to fill holes around the infield gives him value. He’ll likely be given a chance to win the starting shortstop job during the final weeks of spring training. Aledmys Diaz, Jedd Gyorko and Greg Garcia are among the other players who have tried to earn more playing time in Peralta’s absence. All told, it’s a solid value signing for a Cardinals club that needed more depth on the infield. Tejada won’t put up big numbers, but he’s capable of serving as a reliable placeholder until Peralta returns. Chicago White Sox Executive Vice President Kenny Williams reportedly received complaints from staff members and other players before asking Adam LaRoche to scale back the amount of time his 14-year-old son spent in the clubhouse. Bob Nightengale of USA Today reported the situation, which led the 36-year-old slugger to retire, came after other people in the organization privately raised concerns about LaRoche’s son, Drake, spending so much time around the team. It’s noted he attended around 120 games last season. Nobody had any personal issues with Drake, who was at times called the team’s 26th man, but his nearly daily appearances with the club apparently became an issue behind the scenes, according to Nightengale. I don’t think he should be here 100 percent of the time – and he has been here 100 percent, every day, in the clubhouse. I said that I don’t even think he should be here 50 percent of the time. Figure it out, somewhere in between. We all think his kid is a great young man. I just felt it should not be every day, that’s all. You tell me, where in this country can you bring your child to work every day? Starting pitcher Chris Sale took a strong stance Friday, stating: “Somebody walked out of those doors the other day and it was the wrong guy. We got bald-faced lied to by someone that we trust. This isn’t us rebelling against rules; this is us rebelling against B.S.,” per ESPN.com. Ultimately, what happened behind closed doors that led White Sox management to take the issue up with LaRoche still isn’t entirely clear. If there were a large number of players and staff who didn’t approve of the arrangement, it likely felt pressure to push for the change. One thing’s for sure: It’s now become a full-blown crisis. Not only did Chicago lose a potent power threat from its lineup, but it’s clear from Sale’s comments that not everybody is on the same page, which could polarize the club. Rectifying those problems before Opening Day next month is a must. Chicago White Sox veteran Adam LaRoche abruptly retired this Tuesday due to the team limiting his 14-year-old son Drake’s access to the clubhouse. Four-time All-Star pitcher Chris Sale is one notable teammate who’s adamantly come to LaRoche’s defense. He spoke about the tricky situation on Friday. Sale implied Williams should have been the one to leave the organization rather than LaRoche. Per ESPN.com news services, sources told ESPN’s Karl Ravech that Chicago players were contemplating a boycott for Wednesday’s game against the Milwaukee Brewers. Jeff Passan of Yahoo Sports confirmed that to be the case and indicated players who met with Williams were incensed by the clubhouse policy for LaRoche’s son. The White Sox ultimately showed up to play versus Milwaukee, but there definitely appears to be lingering tension within the organization. Per Shaikin, Eaton said on Friday White Sox players hope to meet with owner Jerry Reinsdorf in the next couple of days. LaRoche would have made $13 million this season but chose to walk away, confirming his decision on Twitter with “#FamilyFirst” as the hashtag to end his announcement. The 36-year-old was on a two-year contract and still had some baseball left but is at an age where retirement is within reason. If relations are repaired, perhaps LaRoche will reconsider his sudden decision. According to White Sox players Nightengale cited, though, they’re convinced he won’t be coming back. The Cardinals made their brief statement to Ben Frederickson and Derrick Goold of the St. Louis Post-Dispatch. I was one of the not-so-many players to be given a chance to pursue my dream of being a Major League Baseball player. I was also one of the unfortunate closeted gay athletes who experienced years of homophobia in the sport I loved. I was able to take most of it with a grain of salt but towards the end of my career I could tell it was affecting my relationships with people, my performance, and my overall happiness. I experienced both coaches and players make remarks on killing gay people during my time in baseball, and each comment felt like a knife to my heart. I was miserable in a sport that used to give me life, and ultimately I decided I needed to hang up my cleats for my own sanity. Per Zeigler’s report, one specific instance of homophobia occurred when an unnamed coach said “we kill gay people in Wyoming,” a reference to the 1998 murder of Matthew Shepard in Laramie, Wyoming. It wasn’t clear if Dunnington was referencing a Cardinals coach. This is very disappointing and our hope is that every player, staff member, and employee feels they are treated equally and fairly. Given the nature of these allegations I will certainly look into this further as well as speak with Billy Bean of the Commissioner’s office for further assistance on this matter…we will take this very seriously. The Post-Dispatch added it had contacted Dunnington and Major League Baseball for comment on the story. The 24-year-old Dunnington was a 28th-round draft pick out of Colorado Mesa in 2014. He played that season in two short-season leagues, posting a 3.09 ERA with 29 strikeouts in 32 innings, but he retired before spring training last year. 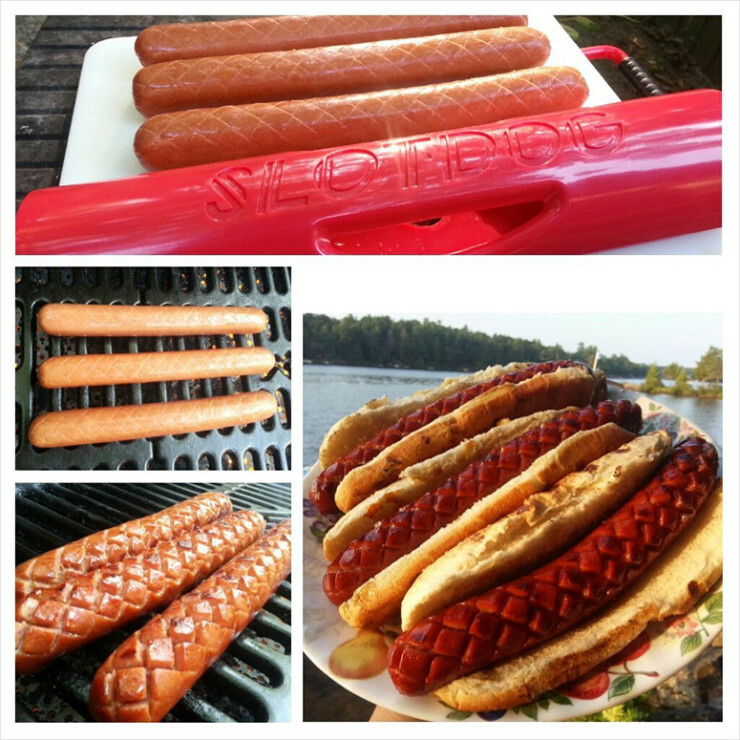 Everyone knows that if you cut some slits across your wieners, they’ll be instantly better. There’s more surface area to crisp, more area to hold condiments, more area to just look cool. You can do your slitting the old fashioned way, with a knife and some elbow grease. Or you can save time with the SlotDog. It’s a simple plastic doodad that cuts a criss-crossed pattern across the surface of a standard dog. Kids will love its dino-skin appearance, and your taste buds will thank you when you realize just how superior a slotted dog is. At $18, it’s the perfect accessory for your next tailgate party.